Dogwood sawfly, Macremphytus tarsatus, has been found on shrubby dogwood species on campus. While this pest looks like a caterpillar, it is actually the larval stage of a wasp-like Hymenoptera species. 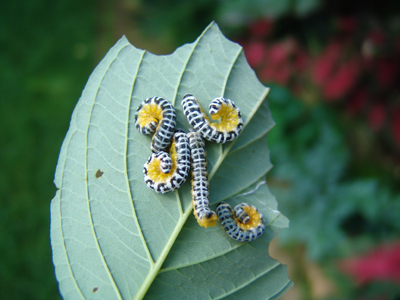 Adult sawflies emerge in late spring and lay their eggs on the undersides of leaves. When the eggs hatch in mid-summer, the first stage larvae are tiny, yellow, and translucent. As they grow and molt, they become covered with a white waxy coating. They usually spend the daylight hours curled up and clinging to the underside of leaves. They can be quite gregarious, with a dozen or more congregating on one leaf. 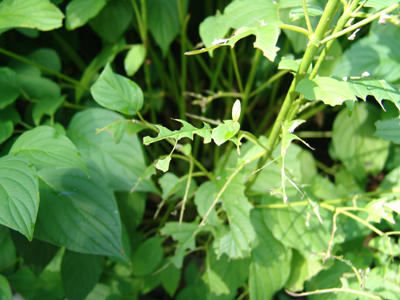 In large numbers, they can cause considerable defoliation and while unsightly, it usually will not harm the plant because it is late in the season. After the last molt, they usually stop feeding and seek a protected spot to overwinter. In early spring, they will pupate and later emerge as adults. Occasionally, wasps or hornets will attack the larvae, which is fascinating to watch. They usually chew the sawfly in half and fly them back to their nest. When the sawfly is detected early, insecticidal soap or horticultural oil is an effective control. In large plantings, chemical controls may be required. When the sawflies are larger, one of the contact or systemic insecticides registered for control may be needed. Thanks for the blog. I now know what has been defoliating my dogwood. A beautiful little guy, but with too much of an appetite! So they were the ones responsible for making swiss cheese out of my Cornus stolonifera ‘Baileyi’. Thanks Bill! Great reference to Doug Tallamy’s book. Also see U of Minn website for more on the sawfly. 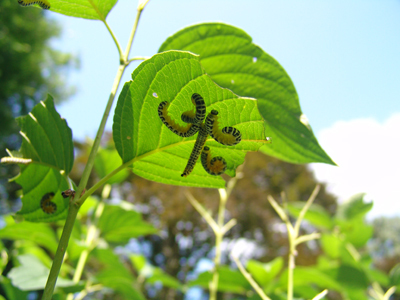 The website lists the dogwood sawfly as a native pest and ranks the plant mortality potential as low. Why not leave them on the host plants, as Tom recommends, to feed the larger life that needs the nourishment to live and thrive? The cosmetic damage to the plant is just that, cosmetic. The nourishment to migrating warblers and thrushes can be lifesaving. I was in ignorant bliss, thinking what I thought were just a few leaves with scalloped edges on my dogwoods to be deer browsing – still a possibility. Once I started looking for them though they’re hard to miss, as is the damage they’ve caused. Mine are well past the cute little colorful stage in your photo, and are already coated with that white, waxy fluff. Still their less loathsome than the Pine Sawflies that feast on my Mugo Pine every few years. Since they’re on Cornus sericea though, and most of what I really care about is their winter stem color I’m inclined to ignore them, and just do a good job cleaning up around them this fall. And if they’ll benefit migrating birds too then the few weeks of ratty leaves will be an acceptable loss. If they show up again in worse numbers next spring I’ll deal with them then. Another pesky worm has killed my squash after eating near the ground!! I wish i knew a way to remove from my garden!! Thank you for this post. I noticed the bugs because the birds were feasting. I feel better about having dogwoods if they feed the birds! Thanks so much for this helpful entry. I just came rushing in after discovering my redtwig dogwood half defoliated and bunches of these on the undersides of leaves. Thanks to the “tubes” identidy discovered. I agree with some of the above posters – think I’ll watch them, but leave them for the birds to enjoy. Next year, however, is a different story!! These larvae are not harmless if your house is made of wood. They will corkscrew themselves into your siding and later a migrating woodpecker will dig in to get them. At first they leave only a little round hole, but if woodpeckers do come along, you will have not only destruction of the wood siding, log cabin, eaves, or whatever, but a very unsightly mess. I have found diatomaceous earth spread around the area, like my woodpile and wooden shed, where they want to bore, will slow them down. This is great information. I don’t want to kill any critter unless it is going to cause serious problems for the area. (I am awaiting a return call from the university extension center to learn whether our area is affected.) If the birds need them, cosmetics are not important to me. Thanks you. This is exactly what is munching away on my dogwoods. Your welcome, Becky. Good luck. are these toxic? i have american toads that would love to snack on them if not toxic. i dont want to feed them these and have the toads die…. my kids would never forgive me!!!! !